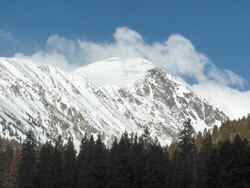 Another so called "easy" 14,000 foot mountain in the Colorado Rockies. Quandary is very simple to get to being only 9 miles south of Brekenridge or 25 miles south of I-70 or about 65 miles west of Denver airport (DIA). I climbed it on May 2, 2004. It took about 7 hours for the round trip - 4.5 up and 2.5 down. There was still significant snow thus requiring snowshoes. The day is an 6 mile round trip from the trailhead with a short vertical gain of 3,370 feet. It is the 12th highest in Colorado. I have climbed it 8 times as of 2012. This report is from my first climb in 2004. 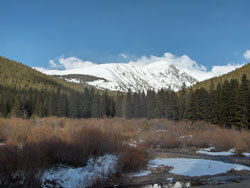 At 8:30 AM, I parked the car down the road from the trailhead due to all the snow blocking the dirt road. On this early May morning it was mild weather. The Monte Cristo trailhead was a mystery but I finally found it after hiking about half a mile from the junction of CO850 and CO9. There is a small sign of the left of CO850. The approach follows a well worn trail though the tree line eventually breaking free about 11,900'. Just below this level, I hit waist deep soft snow. After literally pulling myself out, I put on my snowshoes, gortex bibs and gortex shell. The wind was already blowing so I knew it would be very cold higher up. Meanwhile Bryan and Emily joined me along with Horton, a great looking Labrador. 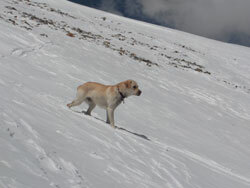 This was their first 14'er and as for Horton, his dog tag had his name and another that said "Quandary Dog". He lead us up and back down. But he actually climbed the mountain twice since he kept running ahead and back down and back up and ... well you get the idea. Some folks were climbing with skins on their skies in order to ski back down. I saw a couple of guys telemarking down or more accurately falling down the steep slopes laughing and having a great time. Horton was on top of their every fall. Soon I too was on top of Quandary Peak. It was a beautiful day with awesome views. After a few shots, I started down. Horton in fast pursuit. 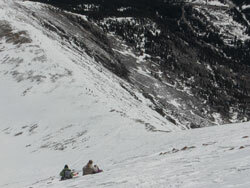 Quandary is an easy Colorado 14'er. It is simple to get to in all seasons. 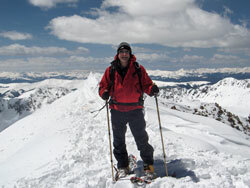 If the snow is deep and fresh, as I experienced, snowshoes are required. Skis are wonderful for the return trip! But best of all is if the Quandary Hound shows you the way up and back down. A true friend never demanding to stop, never asking for water or food. But always there when you sit down to give you encouragement through a lick, a look and a wag. Update: Horton, the Quandary Dog died in April 2011. The blond English labrador was 11 years old. He is missed by anyone who ever met him. This is a story about Horton.